and two high school students who recently finished research projects. 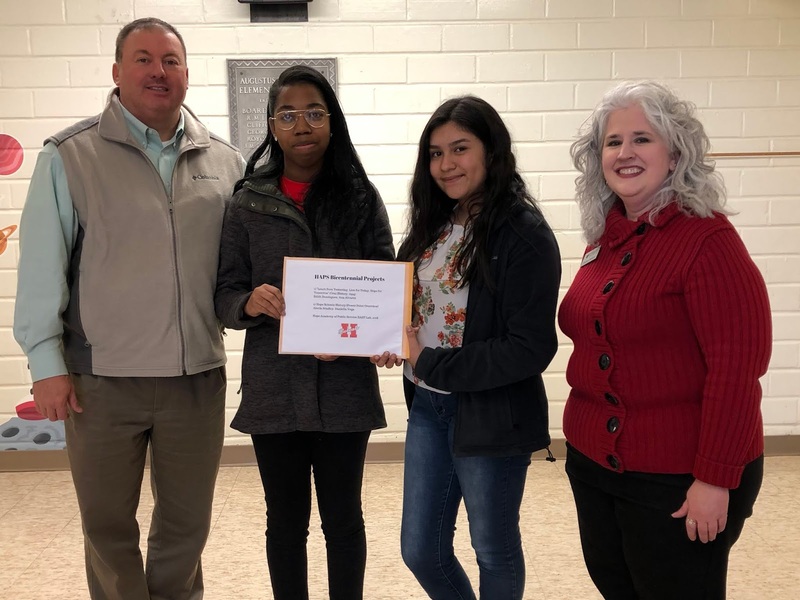 Arkansas State Archives staff recently helped four high school students complete history projects as part of Hempstead County bicentennial celebrations! Two student teams from the Environmental and Spatial Technology (EAST) program in the Hope Academy of Public Service at Hope Public Schools researched and compiled documents for separate projects. Teacher Jacqueline Brady led the student research. Students Edith Dominguez and Ana Alvarez developed a series of oral history interviews called “Learn from Yesterday, Live for Today, Hope for Tomorrow.” The interviews show different aspects of life in Hope and Hempstead County from the pioneer period to today. In the second project, students Alecia Bradley and Daniella Vega created a PowerPoint overview, called “Hope Schools History,” that showcases the development of public education in Hope over the past 200 years. The “Hope Schools History” project is separate from a similar, student-led project on Hempstead County education completed last year, Nesbitt said. School district Communications Director Ken McLemore said the two most-recent projects presented a broader and more modern view of history in Hope and Hempstead County. Copies of both projects were presented Jan. 11 to Nesbitt. They are the only education-related student-led projects for the Bicentennial Year. The projects will be presented to the SARA Foundation at a later date. “These projects represent student research into an aspect of the history of Hope and Hempstead County that will be preserved with SARA and in the Hempstead County Bicentennial Time Capsule,” McLemore said. For more information, contact SARA at 870-983-2633.